RSMeans Data Online provides reliable construction cost data along with the tools necessary to quickly access costs at the material or task level. Users can create unit line estimates with RSMeans data from Gordian and share them with ease from the web-based software. Stay on top of price changes the moment they occur by setting alerts on commonly referenced materials and tasks. Project costs up to 3 years in the future with our industry-leading Predictive Cost Model. RSMeans Data Online Reviews Recently Reviewed! Recommendations to other buyers: Wait for the fixes and wait for the price to come down. The Gordian Group purchased the RS Means product and now they have a system in place where as soon as you type a complaint or email an issue - someone on the other end sends you an email reply saying that it has been fixed .... Well 99% of the time it has not been fixed - the people (upper management) of Gordian need to relax their policies and not make it mandatory to close an issue the day it was created --- People are just pushing papers and they have lost the customer relations part of the process. You get a lot of emails stating that it has been brought up to the engineers attention and that the database creators are aware of the issue and that fixes are coming and the next version will or may or may not have these fixes included .... Not Good - I think to change the thickness of a column should take a few minutes??? Cons: I also have the JOC software from RS Means which no one at RS Means seams to understand and they have tied my passwords to the same account but if I am locked out of one I can not get in the other one. Then all the tech know how to fix this is delete all your cookies. these are place markers for other programs and be cause of the failed IT side of this it makes it hard to accept it as a leader. Pros: Easy to use! Enter your location at the entry screen, save and close and proceed to getting regional cost. Cons: This is a tough question! This software improves ever year. I used to hate how I would have to log back in to the software when I had left it idle, now its not a problem with the new "idle" mode - Thanks! Overall: The cost for this online product is very economical. I am a cost consultant with over 40 years of experience that does work throughout the United States and would not consider any other construction cost software that suits my needs. I also like the online webinar's that features major trends in construction. Pros: I liked the ease of picking up the software functionality for gathering reasonable quotes for new and renovations to buildings, streets and treatment plants. Cons: At times I found that the software was lacking in overall speed when loading requested search items. I was able to minimize this issue by refining my search request as best I could but for new users attempting to compare all items of a requested search it will slow down RS Means, and you would have to wait until the system loads the various items. This was mainly an issue when I had over 700 results for a single search. Overall: I was tasked to gather reliable quotes for new construction and renovations to buildings, wastewater treatment plants and other items based on a provided damage report and memo. I found that RS Means was exceptionally reliable in providing quotes for buildings (i.e. drywall, receptacle, windows, doors, lighting etc.). My main problem and realization with RS Means were that I had to contact manufacturing and distributing companies to gather quotes for the larger more expensive equipment that are housed in wastewater facilities. I can only image that RS Means do not have a major need to have those types of quotes, but it would help to fully round out a great software tool. My overall experience with RS Means was positive regardless of the minor limitation. Pros: One of my favorite features with this software is the locator. Having the costs customized to your location is so handy and much more accurate than applying a general multiplier to each item. Cons: My least favorite feature about RSMeans is the subcategories. I love having all of my HVAC costs in one category but I find the subcategories hard to navigate and find exactly what I'm looking for. Pros: Great for quickly estimating larger budgets. RSMeans Cost Data is second to none. I find it is extremely accurate. Great tool for developers, project managers and estimators. Cons: It is expensive. But I have found it is well worth the money. Pros: Wide range of cost data that is kept up to date. Cons: Some of the item descriptions are confusing and hard to understand what exactly the item entails. Overall: Overall, RS Means is a great tool and resource. It provides a wide range of cost data that is easily accessible. Pros: The software is user friendly and gives a good foundation for cost estimating. Cons: Sometimes I find the cost estimate to be rather low compared to actual bids. Overall: We are a commercial construction company that competitive bid on projects . Pros: Large amount of data provides a good breakdown of project costs and helps identify which items have the most impact on budget. Cons: Difficulty of use - not enough tags for finding line items with alternative names. You have to know the exact name of what you're looking for or there aren't enough keywords to find it. Also not enough variations on some line items to build an accurate proposal. Not enough items specific to site-civil horizontal construction - most horizontal items are specific to the work going under the grade in a vertical construction project. Difficult to build specific prices on something like a water treatment plant or stormwater collection system without having to use surrogate line items. Great starting point for unique estimates. Pros: I like the tools RSMEANS gives for guidance if you are unfamiliar with a particular trade. Cons: The auto logout is annoying. It would be better if you got a log out on your own. Pros: Huge range of trades to choose from, updated cost lists by quarter, ease of use. Cons: The only thing we don't like is that the table doesn't display properly when the browser window is collapsed to half screen. Overall: This software has made our estimates way more accurate and competitive. Pros: Power software with cost data. Love the cost index feature. I like the ability to build an estimate. Cons: Difficulty in searching for desired methods/products and less than desirable estimating section. Overall: I have a great experience when it comes to cost data on items I am able to locate, but find it hard to search and locate the exact item/assembly I am looking for. Also the estimating section could be more user friendly. Some of the assemblies are not specific enough and do not allow different exterior finish options. Pros: It provides a broad cross section of construction industry price data. Cons: Because the data for labor is gathered from a large variety of sources, it is not reflective of common construction pay rates for many labor classes. Locally, very few construction workers receive any type of benefits with their hourly pay. Overall: Positive. We use RS Means to verify the cost reasonableness of construction costs for federally funded disaster recovery costs. Cons: One has to consider the estimate given by the software for reasonableness. Sometimes their numbers are obviously not correct. For the work done most often this is not the case. For some less common work efforts, their data is questionable. The way they name the tasks is sometimes arcane. it seems like people are organizing the data that have not done the work before. Maybe they could use pointers to give something multiple entry points for different ways of saying it. They seem to have "maintenance" relatively often on the weekends, making it hard to use at that time. Overall: Overall it is good data and good software and we have been using it to get reasonable estimates for our jobs. Pros: From change order reviews to estimates needed on bid day when the subs don't always come through. RS Means Data Online is like having another estimator on staff. Cons: Would like to see it a bit less in cost but understand the effort that goes into compiling and maintaining the information. Overall: I have been using RS Means Data Online for over 5 years and it is a go to tool in my estimators toolbox. Pros: That estimates can be saved for better review and for future estimates. Cons: That there are lots of different packages. it should be one price for all data cost. Also that non of the items have pictures for better understanding of what a cost code is about or what it considers. Cons: it does not show pictures like the previous version I used to have. Overall: Quick turnaround is required for funding estimates. RS Means provides a means for a quick turnaround. Cons: - I always want, that when you click any item you have a pop up photo of what the item is. Cons: Certain fields appear to be missing logical data, such as industrial piping, or plumbing, that one would expect to be included in the data base. Additionally, the report formats can be difficult. It is often easiest to export directly to excel and then edit everything in Microsoft than to try and customize within RS Means. Overall: RS means represents the industry standard, at least in our industry, for commercial and industrial construction cost estimating. Pros: Easy to navigate and understand. Software contemplates so many different scenarios that it can be easy to obtain the information you are looking for. I really like the factoring for various city indices. Cons: Provides general information. Need to use the software with caution. Understanding the factors of the various line items is key in developing accurate and reasonable estimates. Overall: I think RS Means is a valuable tool for various levels of estimating, from the non-experienced estimator to the very qualified estimator. From any level, RS Means can provide a sanity check or baseline of putting together a comprehensive estimate. Used with caution, it is a great tool. Cons: While they do ask for your location and adjust the various unit rates, there were many that were not close to the actual costs seen. Cost in Hawaii is very high and hard to predict, but I would have expected more accurate pricing. Overall: Good baseline data source for pre-construction and cost estimating comparison, but can't compete with local experience working in the actual location you're pricing. 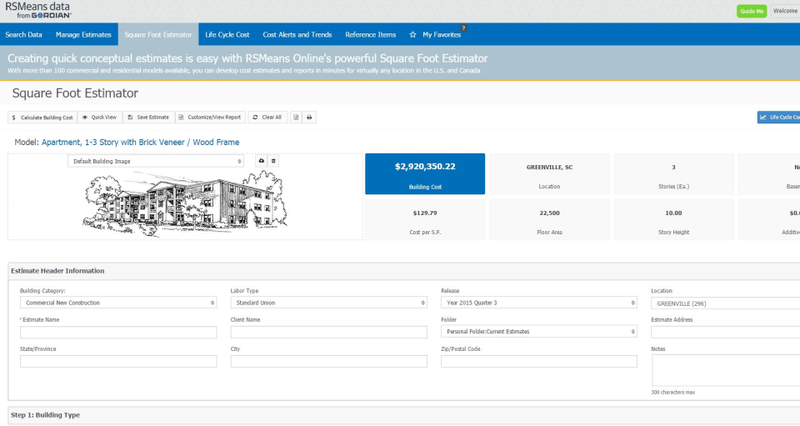 Overall: I use RSMeans to do cost estimates for building repairs, retrofits, remodels and equipment replacements. Make sure that the version also includes the templates and guidelines they're are found in the excellent printed editions! 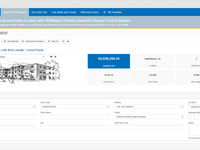 Overall: A great tool to get reliable construction cost estimates. When there is so much action going on in the marketi find that RSMeans enabled me to build defendable estimates. Pros: That I can access it quickly from any devise or area of my office and at home. Cons: Some functions are cumbersome when building some of my data sheets. Overall: I am getting started on construction projects faster by using a branch of the system E-Gordian for special contracting services. Pros: I like the ease of being able to look up multiple items without having to check several pages in a physical book. The online data allows me to look up things quite quickly. Cons: In the search feature if you don't get the wording of the item you are looking for as an exact match to the data, the response comes back as item not found. Without an index of some type, it sometimes makes it hard to find the work item you are looking for. Many tasks are known by multiple similar names, so if you enter the wrong one, Means will not return any data items. Pros: The completeness of construction items that are available with costs. I also like the fact that this is on-line and I don't need to reinstall software each year. Additionally, this allows me to access the database from home. Cons: The search engine is not very forgiving. For example, it will not show items that are close to what I typed in. Overall: I love the sq. ft. models for the various buildings (classroom, office, etc.). However, the HVAC included in the models is unrealistic for our purposes. I would prefer if the software allowed for some alternate systems to be selected, such as different HVAC units. Pros: Availability and abundance of data for specific work. Cons: I don't think it is as user friendly as it could or should be. Sometimes difficult to navigate around in the software. Overall: I use RS Means to complete and compile work estimates mainly for change order items. Without RS Means I don't no where I could get the information I need. It is also accepted by the FHWA and is a tremendous help with my work as a Construction Manager for the DOT. Pros: crews and daily output, it is update quarterly and it is good for big project and complex project. on site work or civil work has more breakdown. Cons: the RSMeans does add variable for small job or the condition of the site, the date need integrate with all variable ex. the construction index, the shortage of materials and labors city by city. .
Pros: Ease of use. Current pricing. Great descriptions. Cons: Nothing, quite honestly. I would love it to be a little more affordable. Pros: This is very handy while in a bind estimating. We use this all the time to check our work, crazy estimates and shore up the numbers we need. Done with the book. Cons: It actually could be a little more user friendly but I never loved the format of the book either. They basically mimicked it. I actually have needed to call ahotline for help and they answered my question right away. 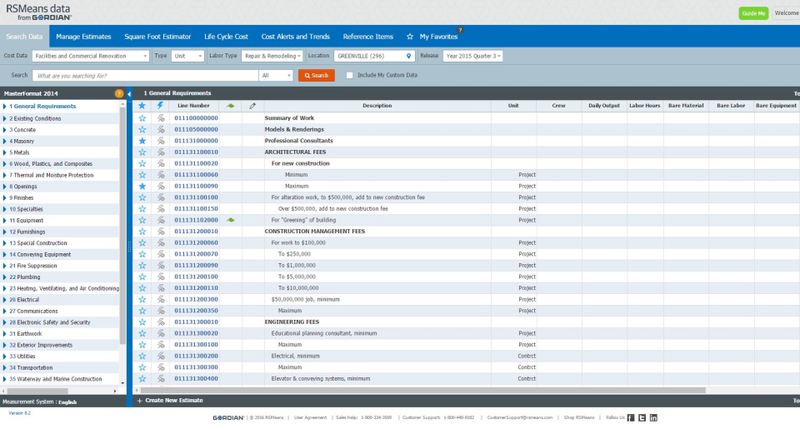 Pros: Access to documents and tables 24-7-365. Cons: Limited construction systems available in square footage data. Overall: Other on-line packages may provide more detail. The Square Footage Estimator is limited, but it is nice having access to the tables and historical information so I can prepare reasonably accurate comps. Cons: would like if the SQFT building cost calculator was a little more detailed in it's cost. Overall: Easy to you and fairly straight forward. Pros: Useful cost data in an easy to read and understand format. Cons: Sometimes the search function "gets dumb" and can't search for items when making an estimate. Overall: Good data but whenever I call in with questions on cost lines, the tech line people don't know the answers and refer me to the engineers. I have contacted the RSMeans engineers multiple times but have never received any response to my questions. Pros: Love the search feature and how detailed everything is, as well as changing the location automatically changes the material/labor pricing to reflect the location. Cons: I really love how the RS Means book (which I also own) has the assemblies section. I have yet to figure out if RSMeans online has this option or how to access it. Pros: The way you can take projects apart and put back together. Cons: If there is something you need and its not there. Comments: back on rs means after a few months of working with it, I was able to get more of the hang of things. the product was easily handled by myself and staff easy to navigate, this product has helped a few of our employees understand the rate for items other than local. Comments: I have been using the online version for about 8 months and although I am old school (paper & books), it has taken me some time to get use to it. Cons: Knowing what Means "calls" items in order to find them. So I may enter a common trade name for an item and Means doesn't recognize it. Pros: - Easy to create new projects and save on data base. Cons: -Unable to fully delete users (student) on RSMeans. They show up every-time we add new students, even-though they are marked as "not active." - Have to look up the crew on a PDF file. It would be great if there was a function that would allow to hoover over the crew number, in the estimates page, and have a pop-up box show you a quick look at the actual crew. Overall: I use RSMeans in my estimating and planning and scheduling courses. I have found it fairly easy to use it, as well as my students. It has the majority of the costs listed that we use in our projects. Pros: It provides aggregated/averaged up-to-date pricing info. Cons: A little unwieldy; search functions could be better optimized. Overall: Using it to price materials and labor estimates for recommended Energy Conservation Measures we offer in our energy audit reports. Cons: Lack of ability to customize and have preset values for specific markets & line items. Overall: Professional service and variety of solutions is great! Pros: I like that you can use it for maintenance cost for different types of work. Cons: It can be challenging to know how to get a report to run the first few times. Overall: Overall this is a good product. Pros: The best parts of this software is that availability to access it anywhere I am. Its been great to be able to show clients a third party cost and the relative effect of different scenarios in realtime. Cons: It can run slow at times and its not intuitive to non-technical users. Overall: It has been a great tool to talk with clients in real-time about design options and their affect on the bottom line. In the past this has been an issue with alot of mistrust around it and being able to show validated third party costs has added credibility to costing work. Pros: I like that I have quick access to average costs. It helps me generate higher quality bids, and serves as a "sanity check" before bid submission. Cons: It could be more intuitive in relation to steel projects, and do a better job of separating "shop fabrication" from "field erection." Overall: Since subscribing to RSMeans we've been able to generate bids twice as fast, with a higher level of confidence that our numbers make sense. We're not overbidding and we're not leaving too much on the table. 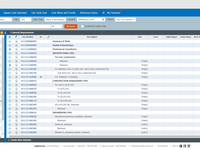 Overall: Easily calculate replacement values with today's material costs. I love that they have a choice of industry standards or the ability to choose custom. The confidence you get from the calculation is great when trying to justify it to the client. I would not hesitate to recommend this to anyone. Recommendations to other buyers: Long time user. Comments: Time to Bid, RSMeans is your go to winner. Pros: Online program is so much faster than the manual. The old way took a while and wasn't updated often enough. Cons: Specific market codes and specialty contractors are difficult to predict in cost because of a rapidly changing economical environment. Pros: Nothing. I have used the printed cost guide manuals in the past- the way the software was "pitched" thought it would be great but you can find better data on Angie's List, etc. Cons: The new program said that it also includes "remodel/rehab" data not just new build. However, the amount of info you have to enter just to price cabinets for example, makes it too time consuming and worst part- it'a not accurate. Online data for free is more useful. Save yourself time and money and use online data and throw your logo onto a word doc to create a bid. I've also used the online chat feature for help and was only told to "go look on the website" etc- very disappointed. Buyer beware- very expensive and they must know their limitations because there are no refunds- so it's a literal trap.